Summary: Cannabis is the most widely used illicit drug in Canada, with a prevalence of 9% in Canadians 15-years and older. Family physicians can make a significant impact by identifying cannabis use and supporting patients who wish to reduce their use. Motivational interviewing, which focuses on building a connection rather than simply telling patients to quit, provides a powerful way to connect with even the most reluctant patients. Though some patients may be able to quit on their own, others may require formal addictions services. Tolerance, as defined by either of the following: a) A need for markedly increased amounts of cannabis to achieve intoxication or desired effect; b) Markedly diminished effect with continued use of the same amount of cannabis. Clinically significant problematic behavioral or psychological changes (e.g., impaired motor coordination, euphoria, anxiety, sensation of slowed time, impaired judgment, social withdrawal) that developed during, or shortly after, cannabis use. The signs or symptoms are not attributable to another medical better explained by another mental disorder, including intoxication or withdrawal from another substance. The following screening questions are based on the diagnostic criteria of the DSM-5. How much cannabis did you use in the past week or month? How do you like to use cannabis? Have you increased the amount of cannabis you use? Have you tried to cut down or quit your cannabis use more than once and failed? Do you spend a lot of time, money and effort getting, using and recovering from cannabis? Do you get a craving, or a strong urge to use cannabis? Have you missed any days of work or school due to cannabis use? Do you continue to use cannabis, even though it causes you problems in your relationships or family? Do you ever miss important social, recreational or work events because of cannabis use? Do you use cannabis in dangerous situations ie. while driving, operating machinery, with other drugs, etc.? Do you use Cannabis even though it causes you physical and or psychological problems? Over the past 12 months have you needed more cannabis to get the same high? Are you getting less high with the same amount of cannabis? Do you smoke cannabis to get rid of your withdrawal symptoms? As per DSM-5 criteria, if your patient answers yes to 2 or more of the above questions they may have a cannabis use disorder. Physical exams on otherwise healthy cannabis users are usually normal. Assessment of vital signs is important including (BP, HR, RR), as tachycardia may be a sign of acute intoxication or an anxiety disorder (Hall, 2009). Note any strong odors from your patient as daily or recent cannabis use can leave behind a unique and strong scent. Many users will use excessive colognes or perfumes to mask the smell. Examine eyes for conjunctival injection, as this may a signs of recent cannabis use (NIDA, 2012). Examine oral cavity including mouth, lips and tongue looking for dry mucous membranes, signs of tar or resin stains which are prominent on the lips or tongue particularly in patients who smoke blunts (rolled cigar papers) or joints without the use of a filter. Conduct a thorough respiratory and cardiovascular exam as you would in a tobacco smoker. Any problems with mood / affect? Any delusions such as paranoid ideation? Any visual or auditory hallucinations? Investigations are usually not needed or recommended in the primary care setting. 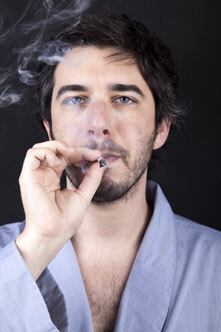 Most patients that are seeking help will self report their marijuana use (NCPIC, 2013). Urine toxicology testing using the Enzyme Multiplied Immunoassay Technique (EMIT) urine test is the most widely used test for cannabis use detection (NCPIC, 2013). Urine toxicology is best used as an adjunct to patients self reported cannabis use (NCPIC, 2013). Urine toxicology can also help to rule out suspected poly drug use, as it can detect recent amphetamine, benzodiazepine, cocaine, and opioid use. If you a concerned about possible respiratory problems in long term smokers, you can order a chest XRAY or pulmonary function testing including spirometer to assess lung function and rule out obstructive lung disease. Currently there are no approved medications for treatment of cannabis use disorder in Canada. Lussier MT, Richard C. The motivational interview. Can Fam Physician 2007;53:1895-6. Lynskey, M.T. ; Heath, A.C.; Bucholz, K.K. ; Slutske, W.S. ; Madden, P.A. ; Nelson, E.C. ; Statham, D.J. ; and Martin, N.G. Escalation of drug use in early-onset cannabis users vs. co-twin controls. JAMA 289(4):427–433, 2003. Mersy D. Recognition of Alcohol and Substance Abuse. American Family Physician 2003; 67:1529-32, 1535-6. Miller RW, Rollnick S. Motivational interviewing: preparing people to change addictive behavior. New York, NY: The Guilford Press; 1991. Zammit S, Allebeck P Self reported cannabis use as a risk factor for schizophrenia in Swedish conscripts of 1969: historical cohort study. BMJ 2002;325:1199-201. Written by Dr. Gurpreet Dhillon, Family Medicine Resident. Reviewed by members of the Family Medicine Program at the University of Ottawa, including Dr's Farad Motamedi; Mireille St-Jean; Eric Wooltorton (2014). Information in this pamphlet is offered ‘as is' and is meant only to provide general information that supplements, but does not replace the information from an accredited Continuing Medical Education (CME) provider.